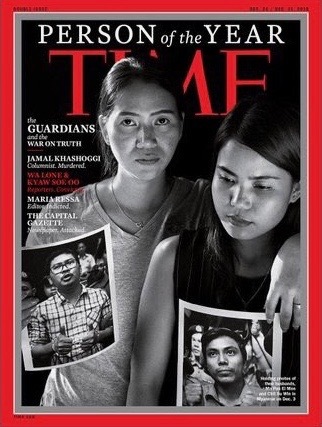 The two Reuters reporters imprisoned in Myanmar are TIME magazine's Persons of the Year with other oppressed journalists for "taking great risks in pursuit of greater truths". They have also won British Journalism Awards. Under the heading “The Guardians and the War on Truth” TIME released four separate covers. They show Reuters reporters Wa Lone and Kyaw Soe Oo, murdered Saudi journalist Jamal Khashoggi, persecuted Philippines editor Maria Ressa, and journalists at Capital Gazette in Annapolis, Maryland where five were killed a gun attack in June. The Reuters reporters’ wives were photographed holding photos of their jailed husbands for one of the covers. TIME editor-in-chief Edward Felsenthal said they were “representative of a broader fight by countless others around the world… who risk all to tell the story of our time”. Wa Lone and Kyaw Soe Oo, arrested a year ago today and now serving a seven-year prison sentence for allegedly breaching Myanmar’s Official Secrets Act, won two British Journalism Awards prizes: Foreign Affairs Journalism and Investigation of the Year (Global). Reuters has said there is no evidence of wrongdoing by either journalist and last month launched an appeal against their sentence.